The Fir currently has a hot water system similar to that of an older home. Cold water enters a tank that has a electric resistor heating element to raise the water temperature. 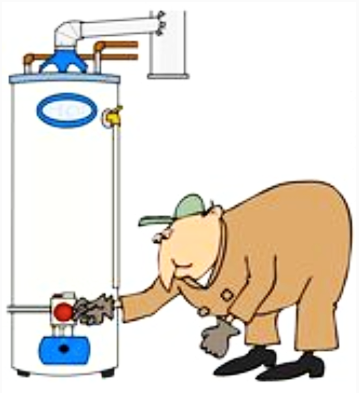 The amount of available hot water is dependent upon the size of the tank. We have a standard hot water tank found on most Navy boats. These tanks are typically cement wrapped in a metal shield. As reviewed in load calculations, our principal heat source will not be electric, but instead fueled by diesel. However, we see no reason to replace the existing hot water tank though we may choose to use it differently. We will also keep the existing resistor base heating system in place as a backup in case of emergency. The hot water system will supply the showers, and sinks in addition to space heating. Domestic need will fluctuate greatly depending on the season, and number of people on board. We intend heat only as much water as is required to supply the current load. Our solution is to convert the existing hot water tank to a storage system for our general heating water, The centerpiece to the new hot water system will be two diesel fired boilers. Heating water will be circulated between the existing hot water heater, and the two boilers. Together, we want about 250,000 BTUs of heating capacity. 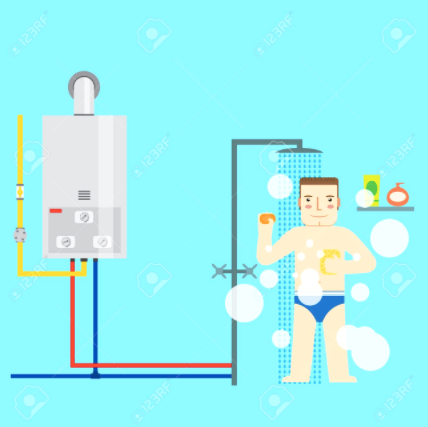 The domestic hot water will be produced by two 30 plate heat exchangers, The heating loop between the existing hot water heater and the boilers will pass through the heat exchangers. A flow switch on the domestic hot water supply starts a pump that circulates additional hot water through the heat exchangers. This should result in an unlimited supply of hot water.